TS Nirudyoga Bruthi 2019: The Chief Minister of Telangana State K.Chandrasekhar Rao also called KCR has announced a new TS Unemployment Scheme for all the unemployed youth in the Telangana state. The scheme is known as TS Nirudyoga Bruthi Scheme and has been launched by the present government under KCR, their CM. The Government of Andhra Pradesh also runs a similar scheme named AP Mukhyamantri Yuva Nestham Scheme. The main objective of the TS Nirudyoga Bruthi Scheme or the Telangana Unemployment Scheme is to provide a mode of sustenance for the unemployed youth of the state. This has been planned to be done through a monetary allowance of Rs.3016/- per month as unemployment allowance to the youngsters of Telangana. Youngsters falling under the age bracket of 22 and 35 are eligible to apply for the benefits under the TS Unemployment Scheme. If you are someone who falls in this age criteria, then this article will provide you with all the requisite details related to the TS Nirudyoga Bruthi Scheme 2019. During the previous elections, the ruling party had released a manifesto and promised to provide unemployment allowance to the youth of Telangana, so that they can sustain life. In accordance with the manifesto, the government has launched this TS Scheme for Unemployed Youth. This is definitely a very good opportunity for jobless youth in the state, to take advantage of the benefits provided under the scheme and use the given allowance money to enhance their technical, vocational and also soft skills. This enhancement in skills will help the beneficiaries in securing employment. Though the scheme was announced by the state government in 2018, it is being implemented from the present financial year ie. 2019-2020. A total budget of Rs 1,810 Cr has been allocated for the scheme by the TS KCR Government. This takes the monthly expenditure on the scheme to be roughly Rs 150.88 Cr. The TS Government has only declared details such as eligibility criteria and the amount of allowance per member. The registration details such as dates have not been made public yet. The TS Unemployment Scheme will extend to about 33 districts of the state and all eligible candidates as per the criteria will come under this scheme’s purview. The TS government estimates that this scheme will benefit about 12 lakh youngsters in the state. The most important part is that the allowance declared in the scheme will be transferred directly to the bank account of the registered candidates. This will diminish any chances of foul play with the allocated money. The objective of giving allowance under the 2019 TS Nirudyoga Bruthi Scheme is to provide the youth with financial assistance required to upgrade and enhance their skills. Deadline for registration (last date) Not declared. Will be updated. The interested candidates should be a native of Telangana state and must have in possession a relevant certificate that is issued by the competent authority. The minimum age required is 22 years. The maximum age required is 35 years. The candidates are required to have completed either graduation from a state recognized University or a Diploma course (such as polytechnic or another diploma) or Certificate programs such as ITI. Only those candidates who possess a white ration card or are presently living below the poverty line are deemed eligible to apply for this scheme. Youngsters whose family, owns 2.50 acres of Maagani land or 5 acres of Metta land in the Telangana state. Any youngster who has any pending criminal charge or is forbidden by law or suspended from a government job cannot apply. Candidates who own/have registered a four wheeler vehicle. Any youngster who has availed a loan of about Rs. 50,000/- from either any central or state authority or a bank. 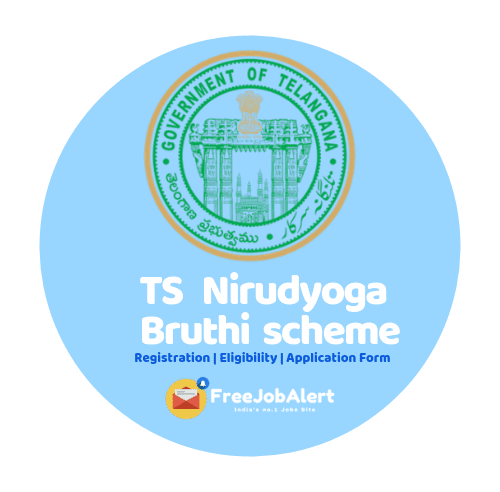 Search for 2019 TS Nirudyoga Bruthi Scheme’s Online Registration link. Click on the link, to open the application form. Fill in the required details which will include Applicant Name, Date of Birth, Aadhaar number, Address, All Educational Qualifications etc. Now upload all the required Scanned Documents and applicants latest photo, signature etc. Then enter applicants’ personal Bank details such as bank account number, IFSC code, name and upload the passbook’s scanned copy. Click on the ‘Submit’ button, once all the details are entered. Take a printout and keep for your reference. Keep visiting this site for more details pertaining to the 2019 TS Nirudyoga Bhruthi Scheme. We will keep on updating the information as and when the TS government issues any other notifications related to the Scheme. Freejobalert 2019 - Admit Cards,Latest Govt Jobs Copyright © 2019.